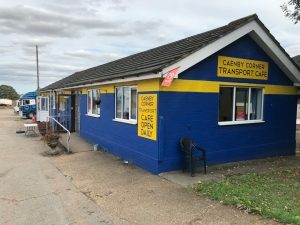 Caenby Corner truckstop is a good, old fashioned truckstop that can be found on the A15 Lincoln-Scunthorpe road at the intersection with the A631 from Gainsborough. 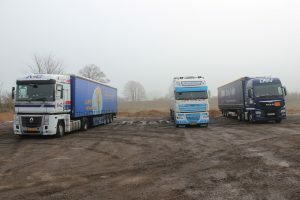 It has parking for about 40 trucks and has a decent range of meals available for drivers. The small costs £4.50 and for that you get a rasher of bacon, a sausage, an egg, a hash brown, beans, tomatoes and a slice of toast. The regular breakfast costs £6.20 and sees two bacon, sausages and eggs as well as mushrooms added. Then there is the Monty breakfast at £7.20 which has an extra hash brown, black pudding, fried bread and extra toast added. The Veggie breakfast is £5 and comes with two veggie sausages, egg, hash brown, beans, tomatoes, mushrooms and toast. Any extra items are 50p a go and each breakfast comes with a mug of tea or coffee included. For lighter breakfast options, there is beans on toast at £2.75, while two eggs on toast is £3, egg and beans on toast is £3.50 and finally cheese on toast is £2. The range of hot sandwiches starts at the basic eggs at £2.50 with veggie sausage, sausage or bacon £3. Sausage or bacon with an egg is £3.50 and sausage and bacon is £4. Finally the breakfast sandwich is £5, and this includes sausage bacon, mushroom, egg and hash brown together! A chip butty is priced at £2.75. the range of cold sandwiches starts at £2. Paninis start at £3 and have a choice of fillings, with extra fillings 50p a go if you want a mix. A salad will set you back £5 while a bowl of chips is either £2 or £2.50 with cheesy chips priced at £2.75. A toasted teacake is £1.20 while toast or bread & butter is 15p a slice with a jam portion an extra 15p. Coffee or tea is £1.20 – including speciality teas, while mocha, latte and cappuccinos are £1.50, as is a Hot chocolate. The latter can come with cream or marshmallows at 50p more. A glass of milk is a pound. The site also sells cans of pop and bottles of drinks, ice creams, sweets, cakes and snacks. There is a minimum card spend of £5. A nice feature is NHS, emergency services and military staff all get a 10% discount. A plain burger with chips is £4 while a ‘dressed’ burger is £3.20 on its own, a cheeseburger is £3.70, a chicken burger is £4, and a veggie burger is £3.50. The ultimate trucker’s burger – which includes three burgers, four slices of cheese and two rashers of bacon is priced at £7. Extras fillings are 50p each and a portion of chips adds £1. An omelette with one filling is £3.75 while with chips it’s £4.75. Fishfingers with chips and either peas or baked beans is £4.20. Gammon and chips with either an egg or pineapple is £5.20. 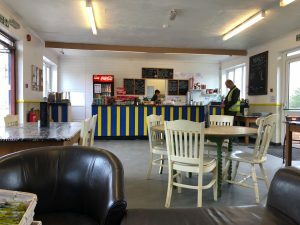 Chicken bites with chips are £4, egg and chips is £3, and egg, chips and beans is priced is £3.20. Sausage or bacon with chips & beans or an egg is £3.70, and with chips, egg and beans it’s £4.20. Sausage, bacon, chips, egg and beans all together is £5. The popular cheese and tomato pizza is just £3.50 and with chips that becomes £4.50. You can add extra toppings such as mushrooms, pineapple and the like at 50p an item. 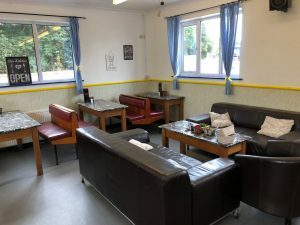 Caenby Corner offers a few main meals and a roast chicken dinner is £6.50 – and comes with a mug of tea or coffee. Then there are traditional favourites such as battered fish, scampi, steak and ale pie, cottage pie or chicken curry and all are priced at £5. These come with a choice of chips, roast potatoes, mash potatoes, rice, vegetables, onion rings, mushrooms or peas. Kids’ meals of all the main menu meals are available for a pound less. There is just a choice of three puddings – syrup sponge, sticky toffee and chocolate sponge and all are £2 each. Truckers who want a second brew can also take advantage of the fact that will be half the price of the first. The dining area – which is clean and tidy – can seat about 40 diners at any one time. 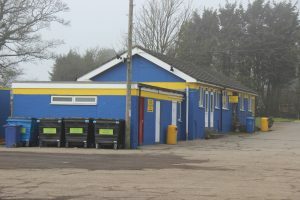 The site is opened from 0700 every day and closes at 1900 on Fridays and 1500 at weekends, there is parking for about 40 trucks and it’s £15 a night to park and there are showers and a toilet block. There is also CCTV for security and free wi-fi for customers. Overall this is a clean and pleasant place to stop at. It’s on a busy road for trucks, so can fill up, so bear that in mind. There is also a petrol station opposite should you need fuel.